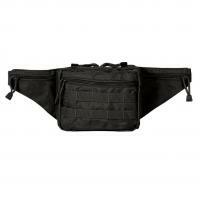 Carry sidearms discreetly without compromising accessibility with the Hide-A-Weapon Fannypack from Voodoo Tactical. Designed for covert weapon carry, the fannypack employs a removable holster to inconspicuously hold medium to large-sized autos. Ambidextrous, right and left side access points allow for draw with either hand. Right and left quick-pull tabs provide rapid pistol access while running, regardless of the Hide-A-Weapon's position on the body--simply pull the tab and draw the weapon at a moments notice. Built with users' needs in mind, zippered waist pockets are ideal for storing keys, headphones, pocketknives and other small, everyday carry accessories. An additional rear hook-n-loop secured pocket provides extra storage opportunities, while the external MOLLE-webbing allows for the attachment of pouches, magazine holders and other gear. The fannypacks are perfect for my use. Delivery was right on. Thanks for the product and the service. Great product. It is exactly as described. I was very excited when I ordered this item. I wore it once. After that the latch in the front didn't stay "clicked." Apart from the latch it looks great. Without a latch it just does not work. I was really hoping this would be the answer to my hot weather carry problems. Voodoo fanny pack is awesome. Good fanny packs are hard to find these days, they are going out of style. But I needed this for my wife to carry her G19 in the car. It is very well built and it will take her years to wear it out. I added an extra pouch for IFAK gear and it is GTG.